"The Tar's Triumph, or Bawdy House Battery," Charles Mosley, 1749, National Maritime Museum. 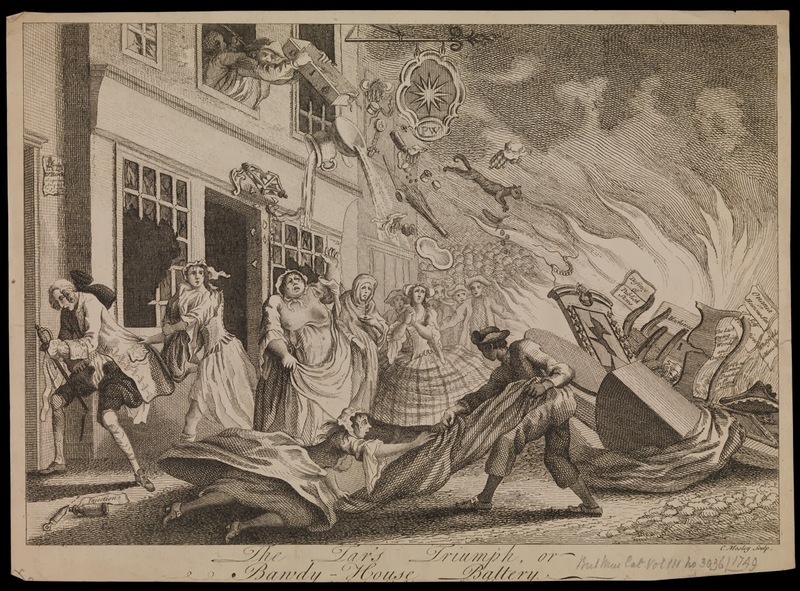 A notorious incident occurred in the 1740's when a group of rioting sailors ransacked brothels on the Strand in central London. This print is just one of several to illustrate the subject, which have been featured on this blog. The British Museum also happens to have a copy of this print, and they wrote an interesting short bit about it, primarily addressing the prostitutes in the foreground. 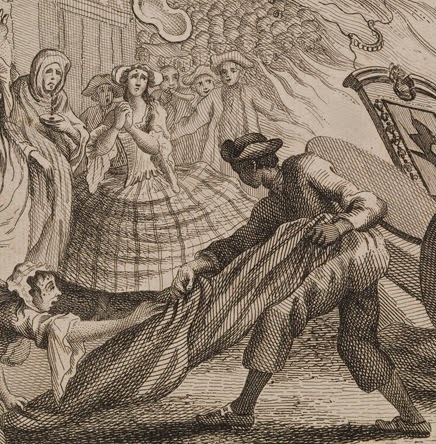 At the center of the piece is a sailor grasping a tablecloth or bedsheet, locked into a tug of war with a prostitute. He wears a cocked hat with the point forward, and a neckcloth tied close and in the fashion of a cravat. His jacket is short for the period, and single breasted. His trousers end about mid-calf. Otherwise he wears rounded toe shoes with rectangular buckles. From the window his mate empties a drawer, spilling a wide variety of items (including a cat and a chamber pot). The sailor wears a reversed cocked hat and an open jacket with no waistcoat.